On the eve of what was the worst attack on our nation’s homeland in recent history, I lay my head down for what I pray is a restful night at the firehouse. Like it was for so many Americans that day in 2001, my day was filled with more emotion than one should have to face in such a few short hours. I say short, because the elapsed time, when reflecting back on that day with the gift of hindsight, flew by relatively quickly. On that day, though…time stood still. Minutes seemed like hours and hours like days. I sat glued to the television while at work for 10 hours straight, and came home still unable to turn it off. All day long, all I wanted to do was hold my family. To hold your mom and sister tight and offer a sense of protection and safety that deep in the pit of my soul I knew I could no longer provide. That day, we all faced the reality that our lives are so much more beyond our control than we ever knew. The safety net was gone, the walls lowered, and our vulnerability was undeniable. It was a day that changed so many aspects of our lives. It was a day that helped me realize I can’t do this life alone. It brought me to my knees seeking answers. Seeking justice. Seeking peace and comfort. Seeking truth. I found the Truth that day. I found that I am a sinner and worthy of death. I found that I am reliant on my Lord and Savior Jesus Christ for my very existence. I found that He took death in my place so that I might be spared. I found the cross. And it’s on that cross that I surrender my all to the One who took the fall. Life has never been what it was before that day. And for that, my dear children, I am sorry. You will never know a world like I knew growing up. You will never experience the same freedom I had as a child. Your childhood will always be in a post 9-11 world where trust is low and tensions are high. As our lives unfold, we move closer and closer to the day of Christ’s second coming. The time is now for believers to share the Truth. We will undoubtedly face many trials, adversities, pain and hardships before that day arrives, and it’s my prayer that as you face those moments you look beyond the pain and suffering. Beyond the evil and malice. Beyond the bad. To find the good that lies interwoven in those events. When evil people do unthinkable evil, there are others who rise to help. To serve. To render aid, to support and to save. There are heroes in your everyday life. Some where a badge or a uniform. Some wear only the blood of their country on their hearts as they bleed with pride in the citizenship of our nation. It’s my prayer that as you grow, those of us who lived through those days can help you to know. To remember. To never forget. Many people in our nation seem to have forgotten. And that, my child, brings a sadness to the very essence of my core. Some have forgotten what “Never Forget” meant. They’ve taken the images of that day down and tried to erase them from our collective memories. They’ve removed them from our mainstream media in hopes that they won’t offend anyone. And even now as I write this, our leaders are discussing the possibility of going to war in Syria to support the heinous people who attacked us twelve short years ago tomorrow! What we all need to remember is that Never Forget means NEVER FORGET. To the families of those who were killed that day, I offer my prayers. Prayers that the God of love and grace will continually keep you. That His arms will wrap around you, not just today on the anniversary of your loss, but everyday. That you might find a peace and comforting rest in His arms like none other. I pray that your grief, though always present, is comforted slightly by the knowledge that there are more of us who know what Never Forget means than those that don’t. And I pray for safety and blessing on those still fighting in defense of our freedom…at home and abroad…on the front lines and behind the scenes…career and volunteer. You all do your part in providing for our safety and freedom, and the very fabric of our lives is interwoven by your sacrifice. that crashes over me like a wave at sea. alone…I need to stay in the Light. this thing that makes me groan. waiting to blow me into the divine. that my sins…and this pain…would one day be gone. with all authority and no longer bound. The fire service, is rich with tradition, many rooted deep in our history. When we start the job, we’re issued a compliment of various Personal Protective Equipment (PPE) that only we wear. Over the course of many years on the job, this gear provides for us a degree of protection…keeping us safe from injury…and yes, even death. It’s not uncommon to grow attached to this equipment, as it quite literally becomes an extension of ourselves. 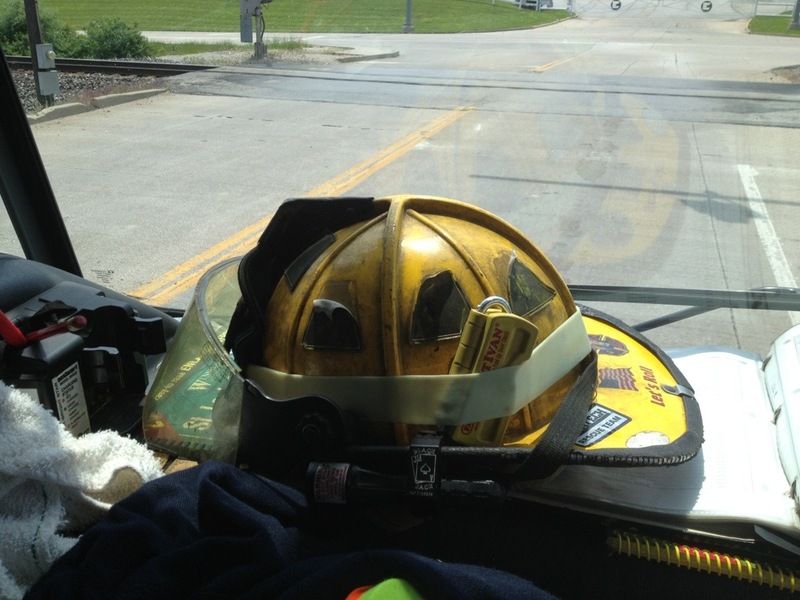 The tradition I mention above is that we wear our gear…particularly our helmet…as a badge of honor. Tradition says that as the helmet has protected us while fighting what others fear, it becomes scarred. Dented. Smoke-stained. Seasoned. 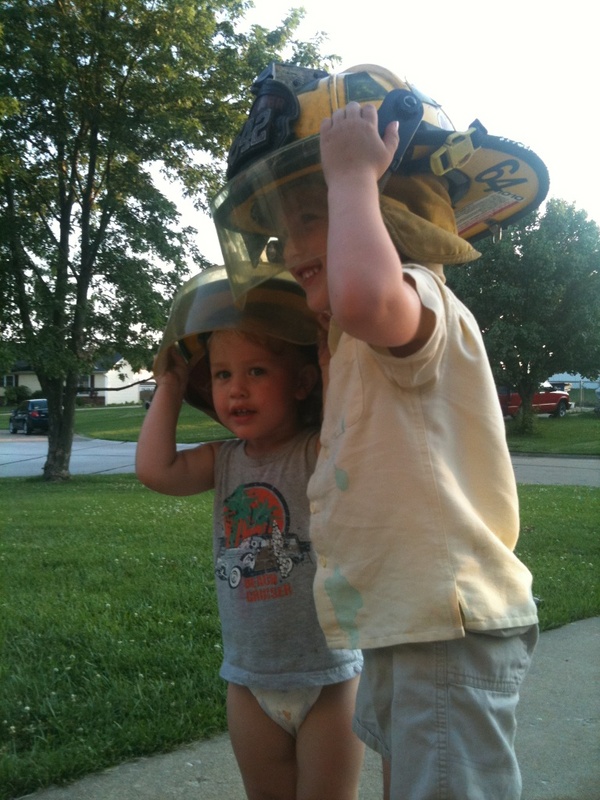 To clean a battle-scarred helmet is to dishonor it and the profession. and the not so exciting. It reminds us to watch our six. So, it’s a bittersweet day at the firehouse today. After almost ten years, I’m retiring helmet #2. Mind you, not by choice…technically it has 5 months before its ten-year life span is reached. Nonetheless, this baby is moving into retirement, making room for a new one to usher in a new era in my career. This piece of equipment representing ten years of life on the job will one day be passed to you. Whatever you do…don’t clean it. It’s done its job and kept me safe…protected me. It’s earned the right to stay dented, scratched, and stained. 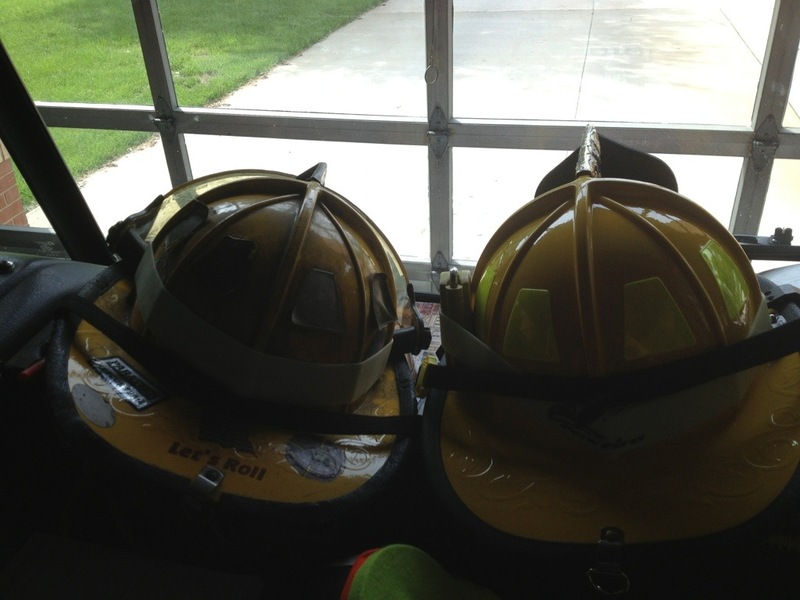 As my old helmet passes the torch to the new one, so I will one day pass the torch of manhood to you…pass to you the sum of my experiences…not just on the job, but in the life I’ve lived. It’s my life’s goal that what you learn from me not be in the words I share, but in the way I’ve lived. That’s primarily why I’ve not written any notes here in awhile…as I am trying to spend more time WITH you and less time writing TO you. It’s my hope that when I’m old and living in retirement, you can look at my scars…my dents…my stains…my wrinkles…my frailness…and proudly see the man of my youth who did his job and protected his family…kept them safe…and raised them up in the Truth. It’s not my job to ensure you’re happy. It’s to help you find joy…even in your darkest moments. It’s not my job to ensure you get what you want. It’s to teach you the skills you will use to provide for yourself and your own family some day. It’s not my job to keep you from falling. It’s to teach you how to get back up and try again. It’s not my job to get involved in every argument or fight you have with siblings or friends. It’s to teach you how to respectfully interact with others who have opinions and beliefs different than your own…and to show you how to think outside the box…and to admit when you’re wrong. It’s not my job to think for you. It’s to teach you how to think for yourself. It’s not my job to pick up after you or to clean up your messes. It’s to teach you how to care for yourself so that you can be a contributing member of society, not a drain on it. It’s not my job to make sure you never lose, or that you always win. It’s to teach you how to lose without losing your cool…and how to win with grace and humility. There are winners and losers in life. There is no prize for participation when you become an adult. The sooner you learn that, the better your odds. It’s not my job to keep you from being hurt. It’s to teach you how to see when others are hurting and to help them. It’s not my job to serve you. It’s to teach you how to serve others. Likewise, it’s not my job to give you money (i.e. allowance) for doing nothing. The government is doing that well enough for all of us. It’s to teach you money management so that you have the ability to live a debt-free life if you choose wisely. You need to know that merely existing as part of our family (or society in general) is not worthy of getting a handout. You want money from me? Earn it. Know, though, that in life there are things we adults do without reward or compensation. Likewise, some chores around here are expected of you…without compensation…simply because your existence contributes to the wear and tear on the things we have. It’s not my job to see that you never experience anger, frustration, disappointment or sadness. It’s to teach you the sanctity of life and that every life matters…and how to control your emotions and to show respect for others regardless of how you feel. It’s not my job to teach you to avoid conflict. It’s to teach you to approach conflict like you’re walking up to a small fire with a bucket in each hand. One is filled with water…the other with gasoline. How you react to the situation (I.e. which bucket you choose to pour on it), is what will determine the outcome. It’s not my job to keep you from making mistakes. It’s to help you learn from them. Many of the best lessons I’ve learned in life came from the mistakes I made. There will be times you’ll make the same mistake more than once. Until you learn from them, you’re destined to keep repeating them. It’s not my job to make sure your heart is never broken. It’s to show you how to lead your heart, not be led by it. It’s not my job to make sure you have friends. It’s to show you how to be a friend to others. It’s not my job to make sure you’re right all the time. It’s to teach you truth…and that there are absolutes in life, regardless of what society wants you to believe about this. There are some grey areas in life, but there also exist a set of absolutes that are true…regardless of whether we believe them to be true or not…and it’s my job to equip you to defend those truths. It’s not my job to stand over you constantly to ensure you don’t sink. It’s to teach you how to swim. In the beginning that means providing you a life jacket to keep you afloat until you can stay afloat on your own. And when you do sink, I’ll be there to extend a hand to help you up…not out…up. Because there’s a lesson to be learned in sinking…one you won’t learn unless you get yourself out. It’s not my job to fast forward through the commercials and previews for you. It’s to teach you patience and self control…and that good things come to those who wait. It’s not my job to fight your bullies for you. It’s to teach you how to protect and defend yourself from tyranny. And that in some situations, the best defense is a good offense. It’s not my job to keep you and your siblings from ever fighting. It’s to remind you that some minor conflict within the family is a natural thing, but that family comes first…we stand on our family’s side in times of conflict from sources outside our family. It’s not my job to ensure you always have a roof over your head. It’s to teach you to be thankful for what you have…because camping out with nothing but the stars overhead is fun on occasion, but the harsh reality is that it’s all the “roof” many in this world have. We’re blessed beyond what we can comprehend. Don’t take it for granted. It’s not my job to teach you how you should vote or who you should vote for. It’s to instill in you a love for your country and a respect for those who’ve served, bled and died to protect your freedoms, including your right to vote…and that it’s not your right to vote…it’s your responsibility. When you don’t vote, you give up the right to complain about your elected officials and anything they do. It’s not my job to solve all your problems. It’s to teach you critical thinking skills…how to explore multiple options until you discover one that works to solve the problem for yourself. It’s not my job to make sure you catch a fish with every cast. It’s to make sure you know how to fish. When Jesus told the disciples to put down their nets and taught them to be “fishers of men”, not even they “caught” every man for Christ. It’s called fishing, not catching, for a reason. We win some…we lose some. But you won’t win any unless you cast the line. It’s not my job to respond to your every request for my attention. Likewise, it’s not my job to be with you 24/7…that’s not healthy. It’s my job to teach you independence…and to take care of my spiritual, mental, physical, and psychological well-being…because when one of those is out of whack, I’m of no use to you or anyone else. Trust me, my sanity is important for your well-being…and as much as I love hanging out with you, I need to be away from you sometimes too. It’s not my job to argue with your teacher for not giving you an “A”. It’s to teach you that we get out of something what we put into it…and to earn the “A” yourself. It’s not my job to shelter you from the storm. It’s to help you weather it. The strongest trees in the forest are the ones who survived the storms, high winds and forest fires. It’s not my job to see that you never lack what you need. It’s to teach you the survival skills that will help you overcome adversity. Trees that survive drought do so by sending their roots deeper into the ground in search of water. The deeper roots provide more strength for the tree. They’re stronger because of the drought than they were without it. The deeper your roots, the stronger you will be. Likewise, it’s not my job to see that your every need is met instantly. It’s to teach you how to recognize the needs of others and to show love and compassion to those less fortunate than yourself. It’s not my job to provide you the latest and greatest “thing”. It’s to teach you to be content with what you have. I grew up without 24/7 internet access, cell phones, DVR’s, or iPods…and I survived. You will too. It’s not my job to put only foods you like on your plate. It’s to teach you where your food comes from and how to provide food for your own family some day, whether by working a job for the money to buy it…or hunting it yourself. It’s not my job to make sure you have fun at school. It’s to teach you respect for your elders and those put in charge over you. For that matter, it’s not my job to provide you nonstop, fun-filled activities throughout the day or to constantly entertain you. You want to have fun? Do what I did…pick up a book. Go outside. Explore your world. 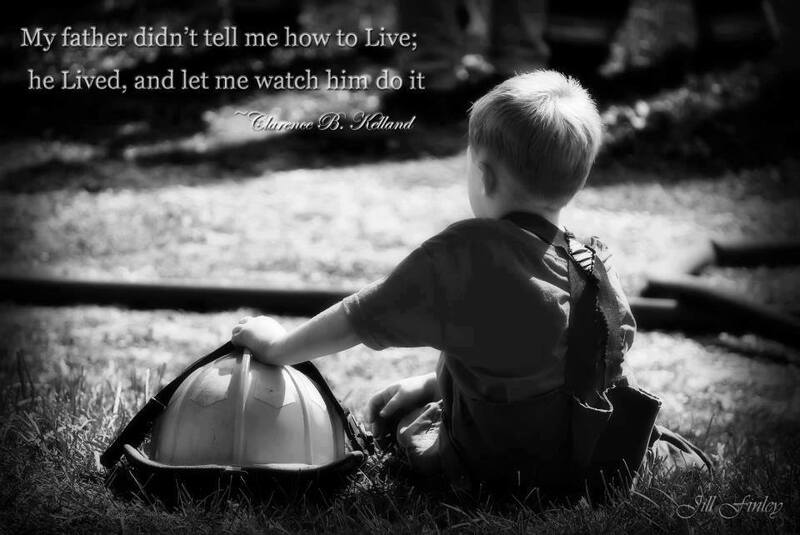 It’s not my job to see that you grow up to become a firefighter like me. It’s to let you see how much I love my job and to instill in you a passion to serve your community. I will love and support you, no matter what you do with your life…that’s what dads do…it’s how we roll. It’s not my job to love you more than your mother. It’s to remind you that she and I existed before you…and we have to live with each other when you leave out on your own. She comes first…yes, before you. I love you, but I love her more. Get over it. Guess what? I love God more than her. She’s over it. It’s not my job to force you to believe what I believe. It’s my job to share what I believe and allow you to choose for yourself. It’s not my job to make sure you never feel lost. It’s my job to show you that you’re already lost. So am I. It’s only through the love and sacrifice of Jesus Christ dying for us that we are ever found. It’s not my job to be your friend. It’s to be your dad…and to teach you how to be a dad someday too. I don’t always get it right, but I’m trying my hardest with every day. The last week or so since I wrote Welcome to My Vulnerability has been pretty good. I’ve been staying pretty busy…very busy actually. This time of year gets pretty hectic with all of you in school and the Upward Sports season starting up. Throw in some of the other ministries I’ve committed my time to, and I just don’t really have the time to sit down and spend much time writing. I miss it. As I write this, I’m watching Bubba play cars on the chair beside me before we leave for school. I was clearing memory cards from the camera last night, uploading pictures and making room. We had pictures dating back to the fall of 2010 on there, so I was getting a first glimpse in several years at what life was like back then So much has changed since then. Life is pretty good right now…even for all the hectic nonstop action we have going on during any given week. I often think back on the times when y’all were kids and wish we could go back. To a time when you were still learning to walk and talk. After browsing through pictures last night, I realize I’m good. Perhaps it’s because I have been so focused on preparing for the basketball season…so wrapped up in my rather large and ever-growing to-do list…that I just haven’t had the space in my head for much else…for any negativity. I like it here. I like being right here. Right now. In the moment. I don’t want to live in the past. Or dwell on it any longer. The funk I’ve been in for much of this past month has kept me from truly enjoying every moment for exactly what it is. Our life. I’m ready to push the memories of that incident aside and move forward. I like it here. I like the present. I like watching you play. I like playing with you. I look to the future with hope and confidence. And with one eye on the future and one eye on the present, I have no eye left for the past. And I’m good with that. I like it here. I had a tough call at work yesterday…one whose images will be engrained in my mind forever. God has been teaching me lately that I cannot, on my own, bear the burden of what I see, do and experience in my job. The demons inside me only live there because I allow them to stay. I’m learning (albeit slowly) that in addition to leaving our burdens at the foot of the cross, we need someone on this earth we can confide in…someone we can bear our souls with. We are not meant to walk through our valleys alone. I received an email this morning with a link to a video “Dancing in the Mine Fields” by Andrew Peterson. I find encouragement in this song…to know that my wife is in this “minefield” of life right alongside me. She may not always completely “get” the pain of what I’m carrying…but she “gets” me, and she’s willing to help carry my burdens with me…if I’m willing to share them with her, so that I’m stronger with her than I am alone. As a man, I have to fight the instinct to share these burdens with her because as men, it’s engrained in us from birth to be the “tough guy”…to “man up”…that men don’t cry or show emotion. However, I believe King Solomon knew that the internalization of our emotions and feelings can lead to self-destructive behavior, and he saw the strength we have in numbers. I’m still working on the HOW part of sharing my burden of yesterday with my wife, your mom…but I know that when I’m ready, she’ll be there to let me. Because pain and suffering is not inclusive to only those in my field, I pray you boys will one day have a wife…and you, SD, will have a husband…who each “gets” you enough to let you confide the deepest secrets of the pain you will eventually have buried deep within your own soul. Please don’t carry your burdens alone. Give them first to Christ…and then share them with your spouse, because we were meant to share our burdens.